MEASUREMENTS: 11-1/4" (29 cm) Diameter. 400g (14 oz). More about Finn Crisp Traditional Whole Rye Crisp Bread An all-natural, whole grain, and low-calorie answer to your crispy cravings: Finn Crisp. Large and round yet still crunchy and thin, the crisps are baked with care to perfection, free of artificial ingredients and GMOs. The large size and shape makes it perfect for serving large groups, where everyone can break off their desired portion. Spread butter, cheese, or hummus and top with any open-faced sandwich topping you can imagine, such as cured salmon, avocado, cucumber or tomato. Serve as appetizers with artful herb garnishes, or as a side for soups and salads. The lightweight crunch and dark rye flavor are a satisfying and healthy Finnish treat. Ingredients: Whole grain rye flour, yeast, water, salt. Store in a dark and dry place. I used to live in Finland so am very nostalgic for these. Delighted that FinnStyle carries them! Shipped immediately, very fresh. This is the same classic crisp my Grandma used to have around all the time. Best with good butter spread on it!!! She called it hardtack. 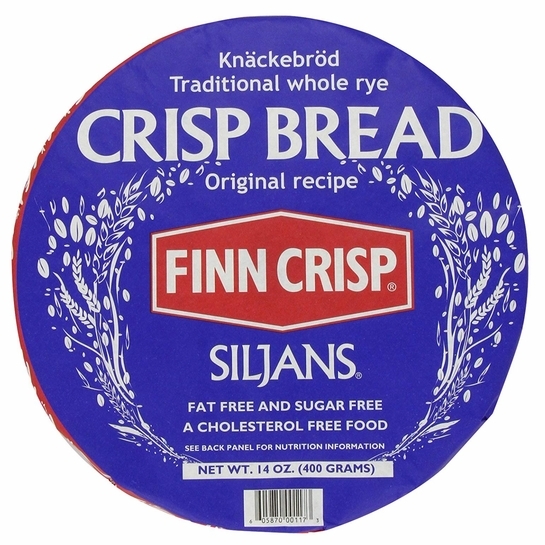 Finn Crisp hard flat bread is the best - other brands just don't measure up. Great taste, perfect crispness. ProsUntil this Finn Crisp flat bread was available on the site, I had to look for other brands, but nothing compares to Finn Crisp brand. a bit of Jarlsberg, Camembert, Limburger and other cheeses, etc. There are FOUR Rounds per package. Recommended serving size is 1/6 of a round for a total of 24 servings per package. What kind of paper is this wrapped in? Wax? Parchment? Is it recyclable? All the pieces are wrapped together in a slightly waxed paper. It depends on your areas recycling guidelines whether this would be acceptable as a recyclable.